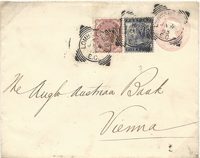 1883 1d Pink envelope franked by a 5d Indigo, SG 169 and 1½d Venetian Red, SG 167 with "GLYN" Perfins, addressed to Vienna and tied by LOMBARD ST. Squared Circles. 1893 ½d Vermilion Stationery Envelope to California franked by two 1d Lilac Postal Fiscals tied by London Squared Circles. 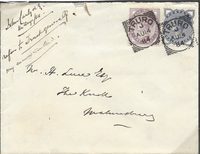 1881 Cover addressed to Lanivet franked by a 14 DOT 1d Pale Lilac, SG 171, and tied by a very fine BODMIN Squared circle. 1884 ½d Slate Blue, SG 187 and 1d Lilac, SG 172, tied to envelope to Malmesbury by SUPERB TRURO Squared Circles. 1886 5d Dull Green, SG 193, tied to Envelope from London to SHANGHAI AND REDIRECTED TO KIUKIANG, backstamped at Hong Kong and Shanghai. Kiukiang was a Treaty Port but never had a British Post Office - probably forwarded by the Chinese Imperial Customs Post. 1882 2½d Blue, SG 157, Plate 23, tied to cover to Paris by a Charing Cross Squared Circle datestamp. 1896 1d Lilac and ½d Vermilion tied to envelope to Tre-Harries R.S.O. by a 'Threadneedle Street' Squared Circle, showing a straight-line 'LATE FEE PAID' in violet - ½d LATE FEE charge. 1881 6d Grey, SG 161, Plate 17. Very fine used with a GRAVESEND squared circle cancellation. 1885 Unpaid Envelope to Torquay showing a remarkable HANDSTRUCK '2d' of OTTERY.ST.MARY plus Squared Circle. RARE and SUPERB. 1904 I.R. OFFICIAL 1d Scarlet, SG O21 tied to printed "INCOME TAX" envelope to Braintree by a very fine SUDBURY squared circle. 1898 ½d BROWN POSTCARD FROM SHEFFIELD TO SARK TO "W. A. TOPLIS", THE ARTIST, CONGRATULATING HIM ON "THE FAIRY GROTTO". 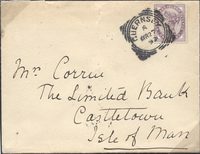 1881 1d Lilac, SG 172, tied to envelope to the Isle of Man by a fine GUERNSEY SQUARED CIRCLE, GC 40 - AN UNUSUAL INTER-ISLAND ITEM.